I've decided that this year, I'd really like to start wearing skirts and dresses for more than just 'fancy' occasions. Shawn and I aren't really fancy people, so there's no point in holding off on wearing my nicer clothing - why not make it a regular every-day affair? I already have quite the collection of skirts in my closet, so I thought it would be nice to fill it in with a few more dresses. My grandmother started me off nicely with a new dress for Christmas so, feeling inspired, I splurged a bit this month and bought a few things I'd had my eyes on. 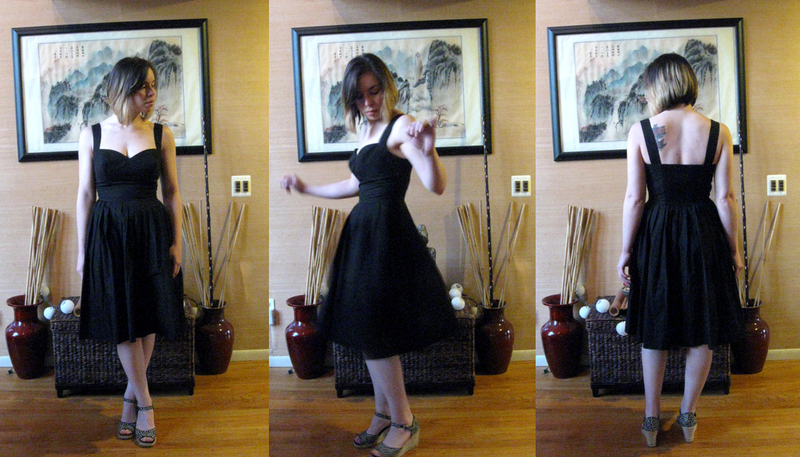 Dresses from the 50's era really appeal to me, particularly because they are shaped perfectly for my figure. That first dress is vintage, and I'm in love with the adorable floral pattern. It fits a little snug in the bust, but otherwise it's the perfect spring/summer dress. And it arrived so quickly- no more than three days after I ordered it! 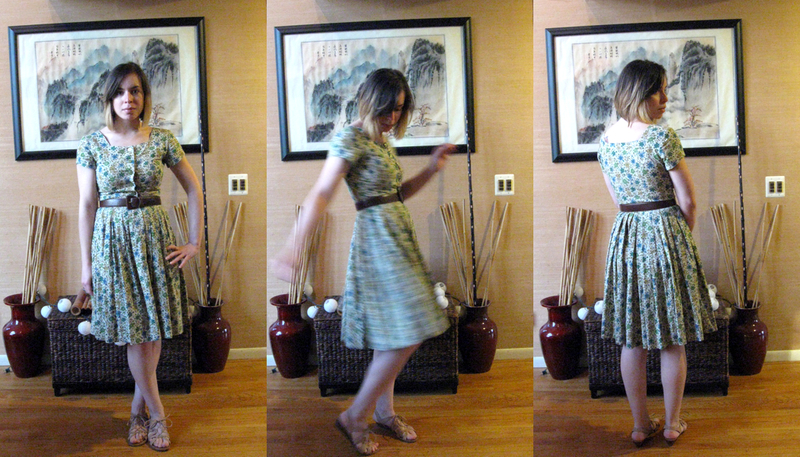 The second dress fits like a dream, because of eShakti's custom sizing option. It's the perfect little-black-dress for the warmer months, and I'm looking forward to getting some wear of it. I'm going to be a bridesmaid at my friend's wedding in July, and after seeing this dress she's considering having all of her bridesmaids order from eShakti. It would be amazing if I get to wear this dress for her wedding, but I'm happy just to have it in my closet. As for the coat, it's a great neutral color that pairs with pretty much everything. The fit is incredibly flattering, I love the stitching details, and the belt really pulls it together. I have two other wool coats already... but I had been on the lookout for a basic 'every-day' coat that wasn't too loud (bright red) or fancy (long, dark, & tailored) like my other two and this one fit the bill. 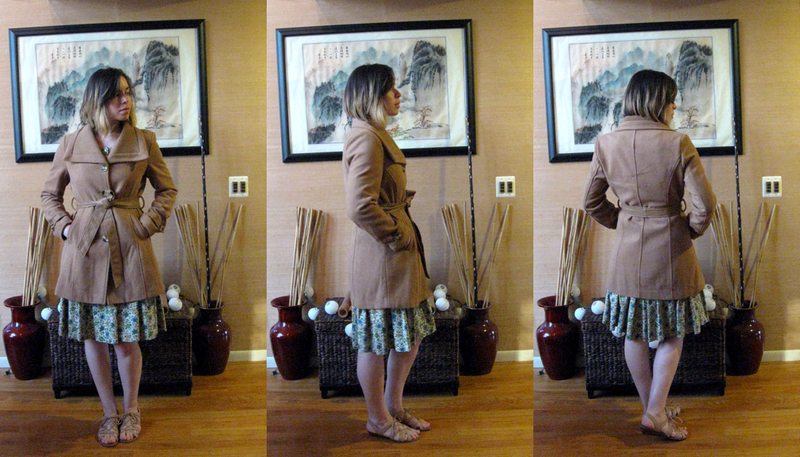 The reviews are what really convinced me - everyone seemed to love this coat, and I'm no different! It's also worth mentioning that Modcloth was an awesome company to deal with. Shipping was fast and free, and the packaging was adorable. They even sent me a free gift! Oh and you may have noticed the new hair cut and color I had done by my awesome hairdresser :) It's the first time I've dyed it in over eight years! Now that it has had some time to fade a bit (it was so intense the first week! ), I'm really loving it, and looking forward to watching it grow out. Shawn is actually trying to convince me to go all blonde... and I can't say I haven't been considering it! *** I thought I should note that I was not paid by any of these companies to talk about their products. I'm just really happy with each experience and I wanted to share my enthusiasm!